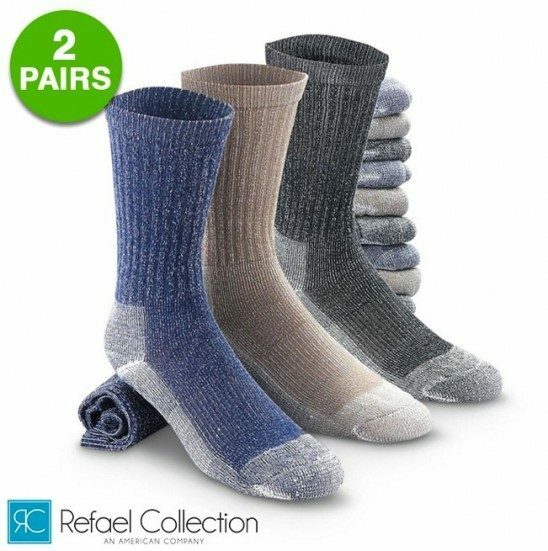 2 Pairs: Merino Wool Thermal Socks By RC Collection Just $3.99 Down From $24.99! Ships FREE! You are here: Home / Great Deals / 2 Pairs: Merino Wool Thermal Socks By RC Collection Just $3.99 Down From $24.99! Ships FREE! GearXS has these 2 Pairs: Merino Wool Thermal Socks By RC Collection on sale for $3.99 (Reg. $24.99) when you use promo code 9OFF + FREE shipping! Get ready for the cold weather with these insulated Merino Wool Blend thermal socks. Being cold resistant, heavy cushioned, and having arch support, these socks are perfect for any, and all, outdoor activities. Available in size 10-13 (Men’s), 9-11 (Women’s) and 6-8 (Kid’s), each sock is made of 68% Merino Wool, 20% Cotton, 10% Polyester, and 2% Spandex. If warmth, comfort and protection from the elements is what you are looking for in your cold weather socks, then you have come to the right place!